He took part in the Omdurman campaign (1897 - 1898) and the Boer War (1899 - 1902). His rank remained inspector of general cavalry in India from 1903 until 1906, when he became director of military training at the war office. In 1909 he became chief of staff of the Indian army. At the beginning of World War One in 1914, Haig commanded the first Army Corps. In December of 1915 questions were being raised about how well the war was being fought. 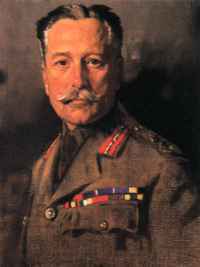 On the 10th December a new commander of the British was appointed - Douglas Haig. He was 54 at the time and had a long a successful military career behind him. Even with his experience though, trench warfare was a new form of fighting, so he faced a difficult task. In February 1916, Germany began a campaign against the French at Verdun. Five months passed, 700,000 men had become casualties, and the French were only just hanging on. The British decided they had the relieve the pressure on the French. The British high command, led by Field Marshal Haig began a major attack along the line of the river Somme, he hoped to lure the Germans away from Verdun. After another five months the British had captured little land. On the 18 Nov 1916, in the blizzards and snow Haig called a halt to the attack. The battle of the Somme was one of the most bloody of the First World War, more British soldiers had been killed than in any other battle before it. It earned Haig the title 'Butcher of the Somme', after he unnecessarily sent thousands of British troops to their deaths. He died in London on January 28th 1928. "Success in battle depends mainly on morale and determination." "The way to capture machine guns is by grit and determination." "The machine gun is a much over rated weapon.."
"The nation must be taught to bear losses. No amount of skill on the part of the higher commanders, no training, however good, on the part of the officers and men, no superiority of arms and ammunition, however great, will enable victories to be won without the sacrifice of men's lives. The nation must be prepared to see heavy casualty lists."